SEOUL -- Police sought an arrest warrant Thursday for the wife of South Korea's Hanjin group chief Cho Yang-ho, accusing her of verbally and physically assaulting company employees, housekeepers and others habitually by using her superior position. 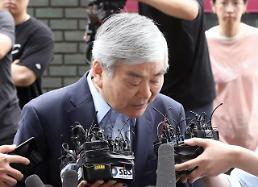 Lee, 69, has been widely criticized as a typical example of "Gapjil" that means an abuse of power such as mistreatment, arrogant behavior, crude talk, character assassination, and insults. There have been numerous public calls for her punishment since police launched a probe into her wrongdoing last month. She was questioned by police twice this week, based on testimonies from 11 victims. On Thursday, police asked a court to issue an arrest warrant for Lee on multiple charges that included assault, injury and the obstruction of business. Police accused Lee of using her superior position to assault, insult, and injure those in the socially weak person "habitually without any special guilt," citing concerns that she may try to destroy evidence because she kept denying accusations, insisting she cannot remember. Some 170 witnesses have been questioned, and police said Lee was involved in 24 cases of crimes against 11 people from 2011. She allegedly hurled scissors at a security guard in his house, kicked a chauffeur, beat a gardener and slapped a construction worker. 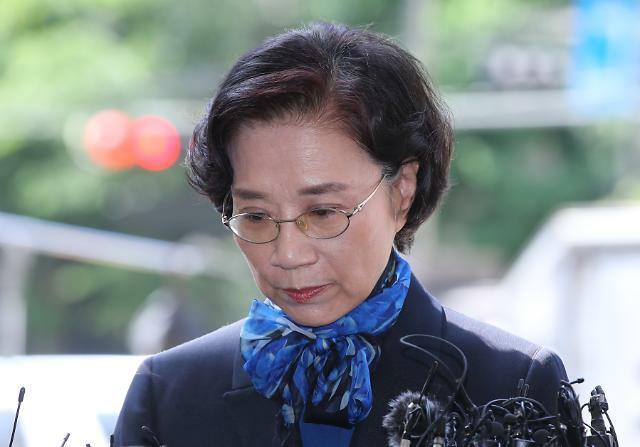 She is suspected of assaulting employees of Hanjin, a family-run conglomerate known as chaebol, which controls Korean Air, the country's top flag carrier. Allegations about her insulting remarks and abusive treatment of her personal staff and construction workers renovating her home fueled public anger at a time when her two daughters were investigated. The interrogation was the latest in a series of investigations by law enforcement authorities into the ruling family's illegal activities, abuse of power, assaults, tax evasion and smuggling of luxury goods. Police have questioned Lee's youngest daughter, Chu Hyun-min, on charges of assault. She lost her temper during a business meeting on March 16 and threw a glass cup at an advertising company official. Many South Koreans saw it as emblematic of a generation of spoilt and arrogant offsprings of chaebol owners. Last week, Lee’s eldest daughter, Cho Hyun-ah, who formerly served as Korean Air vice president, was quizzed by immigration authorities over allegations that she and her mother have illegally hired Filipino housemaids at their homes. Cho Hyun-ah was arrested in 2014 for an onboard tantrum when served macadamia nuts in a bag rather than a bowl. She was imprisoned for a year for violating aviation law but she was released in May 2015 after an appeals court suspended her sentence.